I count myself lucky ( and OLD ) to have traveled by rail. It was a delightful and relaxing experience. I was fortunate to have ridden the Santa Fe Super Chief, and the Santa Fe El Capitan. Those days are gone, but not forgotten. I don't have quite that much tenure on this earth, but I still love riding trains ... ridden most of Amtrak's long-distance routes end to end. I'd love to have a time machine, though, to be able to experience the great passenger trains of the 1950s -- what an era that must have been. Thanks for remembering the "incomparable" Empire Builder on its birthday! James J. Hill, the “Empire Builder” died in 1916 at age 77. It was 13 years after Hill’s death, that the Empire Builder was inaugurated in his honor. The Empire Builder operated with non-streamlined equipment for 18 years (1929-1947). 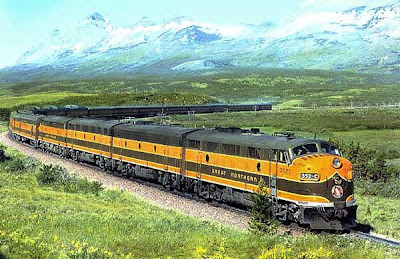 The Empire Builder operated with streamlined equipment for 62 years (1947-present). The Empire Builder operated with dome cars for 24 years (1955 to 1979). The Empire Builder operated with Superliner equipment for 30 years (1979 to present). The Empire Builder operated as primarily a Great Northern train for 41 years (1929-1970). The Empire Builder operated as a Burlington Northern train for 1 year (1970-1971). The Empire Builder has operated as an Amtrak train for 38 years (1971 to present). The Empire Builder running mate “Oriental Limited” operated 30 years (1905-1931 and 1947-1951). The Empire Builder running mate “Western Star” operated for 20 years (1951-1971). The Empire Builder rival “North Coast Limited” (CB&Q/NP/SP&S and later BN) operated for 71 years (1900-1971, with 23 of these years being a streamliner). The Empire Builder rival “Olympian” (Milwaukee Road) operated for 50 years (1911-1961) with its streamlined version (the “Olympian Hiawatha”) running from 1947 to 1961. The Empire Builder rival “City of Portland” (primarily Union Pacific) operated for 36 years (1935-1971). The Empire Builder running mate “North Coast Hiawatha” (Amtrak) operated for 8 years (1971-1979). The Empire Builder running mate “Pioneer” (Amtrak) operated for 20 years (1977-1997), though the train was a combination with another train (the San Francisco Zephyr until July 1983, the California Zephyr thereafter) between Chicago and or Denver, Salt Lake City, or Ogden, and didn’t begin through car service between Chicago and Seattle until 1981. And your list of superlatives is quote interesting. The thing that strikes me the most about them is the fact that the Builder stands a very good chance of becoming America's longest-running name train fairly soon, if Amtrak's plans to reconfigure the Sunset come to pass. That will be bittersweet, indeed.